The future of meetings is here: from new benchmarks for user experiences to technological upgrades. We take a look at the forces redefining the meetings industry. According to the latest research the number of real-time meetings and events — such as medical conferences, trade shows or sales and marketing meetings — is still on the rise. While video conferences can replace many days live meetings, people still seek human interaction, and the role of real-time conferences in education and networking is more important than ever. A study by the Melbourne Convention Bureau of meeting industry professionals concluded that more than four out of five respondents (86%) believe that attendees will continue to place strong importance on meeting face to face. 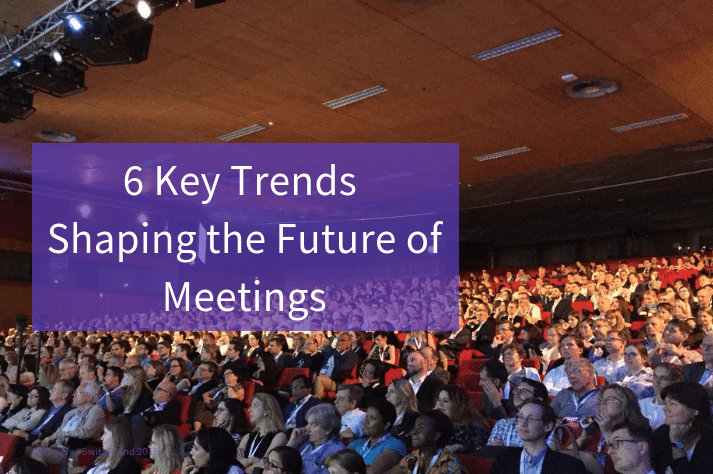 Like so much else in the digital age, the conference and meeting experience is changing fast. In a recent white paper by the IACC (International Association of Conference Centers), a survey of meeting industry experts found that three quarters believed that access to interactive technology is far more important than it was just five years ago. With virtual reality now going mainstream, technology is integral to every aspect of the meeting and enables an individualised meeting experience and more interactive presentations. The new generation of conference halls with purpose-built, flexible meeting spaces is designed for networking, collaboration and active learning. Sustainability is high on the agenda for meeting planners: digital handouts are great, but delegates might well expect a more ambitious environmental effort. Raise the benchmark and make your meeting zero-waste by recycling posters and banners and composting discarded materials. Delegates are increasingly demanding an immersive experience, so choosing a venue with events spaces off-site will give your meeting the wow factor. A museum, art gallery or zoo may offer after-hours visitor experiences that will create a memorable experience for your attendees. A city with a lively social scene will do much of the work for you: promote interesting local events – a dance class, a football match – to delegates, organise a group visit and allow the event to cast its memory-creating spell. One of the key advantages of a real-time meeting is the opportunity to network with peers during breaks and leisure hours. From coffee breaks to delicious banquets, food and drink go a long way towards ensuring a memorable and enjoyable meeting experience. Make the most of local delicacies: request caterers to use fresh seasonal ingredients and feature local specialities on the menu. If your venue permits, build a visit to a foodie’s or farmer’s market into the itinerary or take a tour of a local craft brewery or vineyard. Satisfied delegates who have been well fed and watered are more likely to return next year. Delegates attending medical conferences are likely to appreciate opportunities for relaxation and exercise. Meeting planners should consider booking accommodation at a hotel with a gym while organising an activity, meditation or yoga class before the meeting begins is likely to be popular. A morning run like offered by IMEX before the day’s events is the perfect way to unwind in the fresh air. Related: Are Healthy Conference Choices Now Preferred Among Conference Attendees? Time-pressed attendees will be attracted by venues that allow them to combine business with pleasure. Conferences in major cities such as Paris, London or Berlin will naturally tempt visitors to stay on for a few days but check out smaller venues such as Basel or Zurich. Historical interest, a thriving culinary scene, and beautiful countryside scenery offer an exciting user experience. Changing expectations mean that it is more important than ever to make sure that attendance levels remain high. Staying abreast of future trends for meetings and events will help you to not only meet but surpass these demands.